This collection of true stories is written by Mihee Kim-Kort and Andy Kort, a married clergy couple who met while they were in seminary. 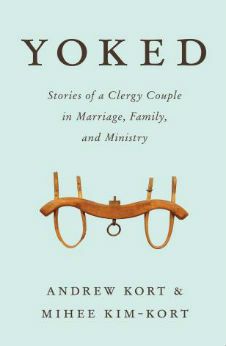 They share their unique perspective on the joys and challenges of ministry in alternating segments, forming a collective narrative that illuminates the inner workings of a clergy marriage, even as it inspires with heartfelt tales of life in ministry. Throughout the book Mihee and Andy relate their respective impressions of shared experiences, revealing inherent differences and potential sources of conflict, but also demonstrating how they work through their differences, communicate, and collaborate to make the most of their strengths. With 20 years of ministry experience between them, a blue Subaru Outback crammed full of child car seats, an old dog named Ellis, and life experience in three states, Andy and Mihee have struggled with infertility, survived the threat of foreclosure, travelled abroad and led mission trips together, and through it all remain yoked together. This tale of endurance is only made possible by hard work, sympathetic friends, endless conversations, countless cups of coffee and bottles of beer, and the grace of God.